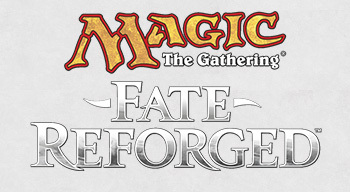 Fate Reforged is bringing three new mechanics into Standard Pauper. I've already spent some time talking about Manifest and how it functions on Ethereal Ambush. As I continue to work on my set review for Standard Pauper, I thought I would take the rest of this week to look at the other two new mechanics and what impact I expect them to make in the format. Today we'll be looking at the Dash mechanic. At Common, we only get three cards with Dash - Alesha's Vanguard, Goblin Heelcutter, and Mardu Scout. None of these cards have any special ability that is triggered when they are cast using Dash; you merely get a reduction in mana cost (1 less for the Vanguard and Heelcutter, 1R instead of RR for the Scout) when the corresponding effect of returning it to your hand at the beginning of your end step, assuming of course it's still on the battlefield. This effectively allows the creature to attack 2 rounds earlier than normal. So the real question is this - when is it better to cast these creatures for their Dash cost? As a surprise attacker. When your opponent has just enough blockers to hold your creatures back, swinging in with a Haste creature can be just what you need to push through additional damage. Or if it forces your opponent to deal with it on that turn, you've effectively gained some tempo through the discounted casting cost. To dodge Sorcery speed removal. If you strongly suspect that the only way your opponent can deal with your creature is with Sorcery speed removal, and you've got the mana to spare, using Dash prevents your opponent from ever having an opportunity to interact with it. When the game is about to end. If you can end the game either this turn or the next, and you don't need any blockers, then using Dash makes sense, because you otherwise would not get to deal any damage with that creature. But in general, even if Dash allows you to attack with a creature one round earlier than you would otherwise be able, you're better off just casting it normally. Assuming that you have other spells to cast, it will be more efficient in the long run to cast the creature normally and get value out of it turn after turn. That being said, these three creatures are not very impressive as vanilla creatures, so unless you're playing an aggressive deck that will be able to setup board states where one or more of those conditions apply, you're probably better of not playing these creatures. They're not terrible, but should only see play in decks built around them specifically. What do you think of the Dash mechanic in general and these three creatures in particular? Let me know in the comments below. Thanks for reading.